Provides operator assisted clients with a view of who is on their call, who is in the question queue and a direct line of communication with their lead operator via the chat feature. If you are trying to log on for your assisted call, you will find the conference number on your confirmation. Alternatively, your lead operator can provide this to you. Provides access for hosts and guests to log into a C-Meeting. Email or give us a call at 1-800-319-3929 if you would like to set up a demo or an account. Provides individual passcode account holders access to see their call records, view their conference call in progress, and modify some of the settings as required to meet their needs for a particular conference call. Use your account host and guest codes to log on. Provides a select few administrators within your organization a portal to set up or modify passcode teleconference accounts for anyone who needs an account within your organization. Contact your Chorus Call account executive for more information. 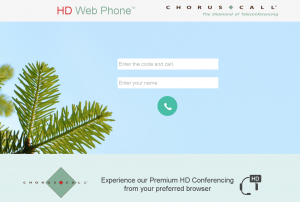 Provides anyone with an HD microphone access to join a conference call or present to a webcast or webinar audience with high definition audio. Contact your Chorus Call account executive for more information. Provides authorized individuals access to view records of invoices right down to the call detail level. Also shows which invoices have had payment applied and which remain outstanding. Contact your Chorus Call account executive for more information.